Air conditioner not as cold as it could be? 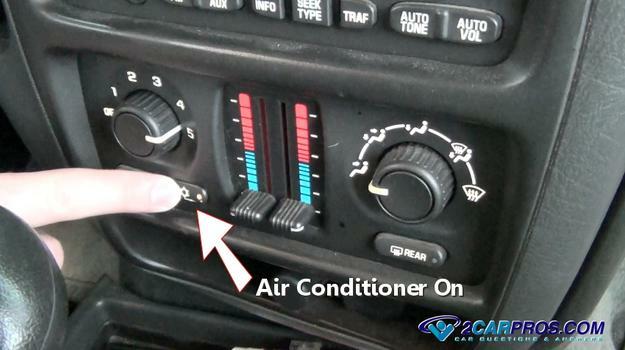 8 times out of 10 when an air conditioner is weak or not working it is due to a low refrigerant charge in the system. An air conditioner system is much like a tire and can loose its charge naturally over time. 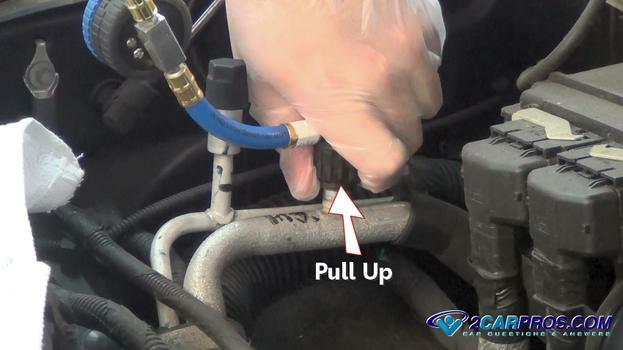 If you are sure the system charge is okay, skip this guide and continue to the air conditioner repair section or if the system is flat with no refrigerant continue to the leak detection section. Please watch this video below and then continue down the guide for more tips and information which is updated regularly. 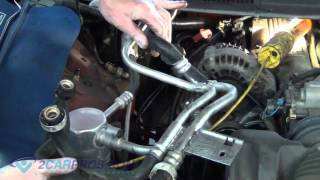 You will need an a/c charge kit which you can get from Amazon from about $26.00 bucks. It's a good idea to see how the air conditioner system works before you begin. 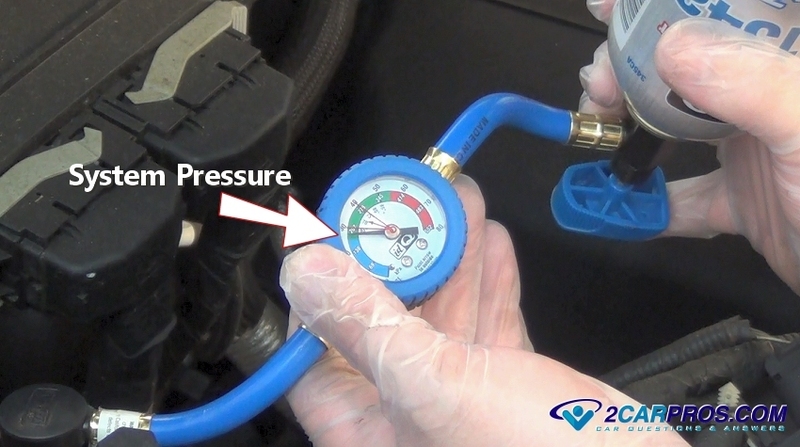 This is a simple charge kit which includes a valve to control the refrigerant flow that is located at the top of the charge can, a gauge which tells you the pressure in the system and finally a service port connector which enables the refrigerant to flow into the system. The first step in the charging process is to locate the low side system service port which is fitted onto the larger of the two refrigerant lines. This line will be one of two which travel out from evaporator core (near the firewall) and will lead to the rear of the compressor. You may have to look around a little as these locations will vary and can be obscure on some vehicles. The low side pressure port will have a smaller fitting than the high side port which will be larger so the kit connector valve will not fit onto it. In the image below you can see the high side pressure line is always smaller than the low side pressure line. 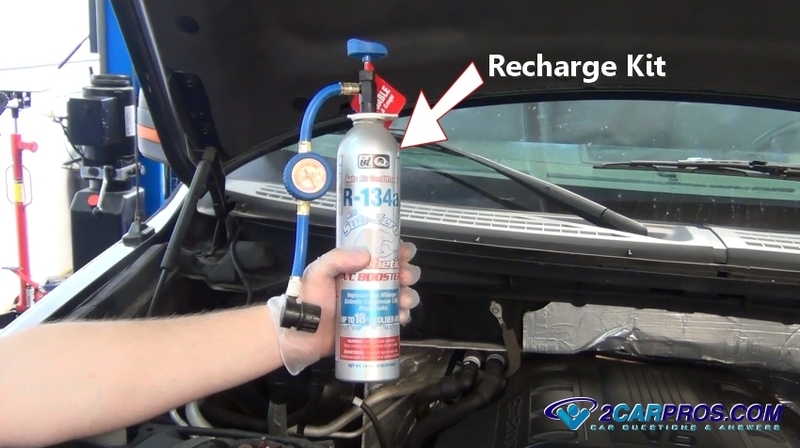 The low side service fitting is equipped with a hard rubber ball valve which the recharge kit connector pushes downward to open and service the system. Once you have located the low side port twist the cap counterclockwise to remove it. The top of the cap should have an O ring which will seal it to the fitting. 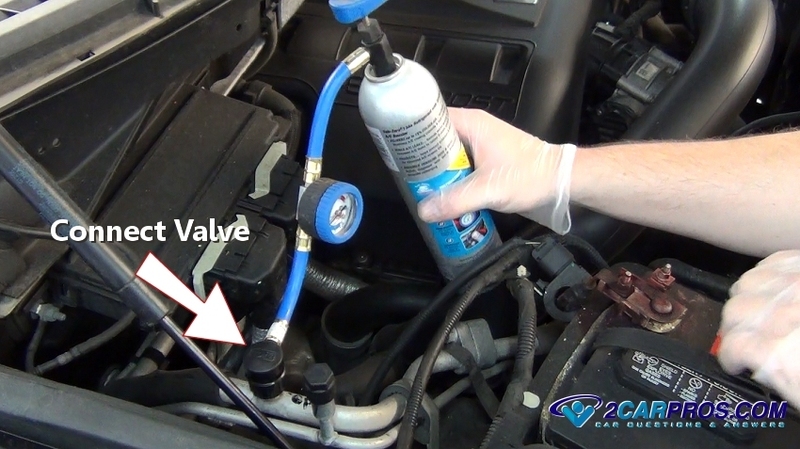 If when you remove the cap you hear a leak this valve is bad which can be fixed by simply replacing the cap firmly or replacing the valve once the system is empty, this is not too common. 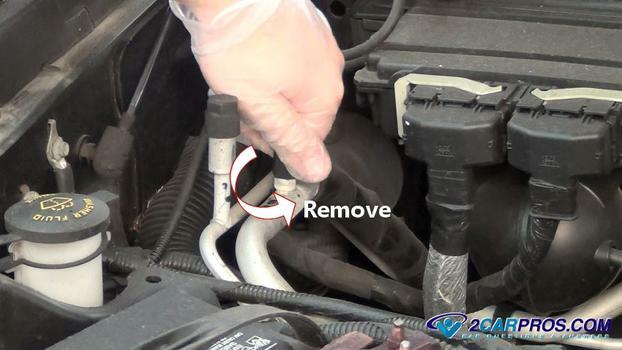 Start the charge procedure by removing the safety located at the valve base which is indicated by a white or red plastic tag. Pull the connector retainer ring upwards press down firmly onto the low side service port to attach the connector. 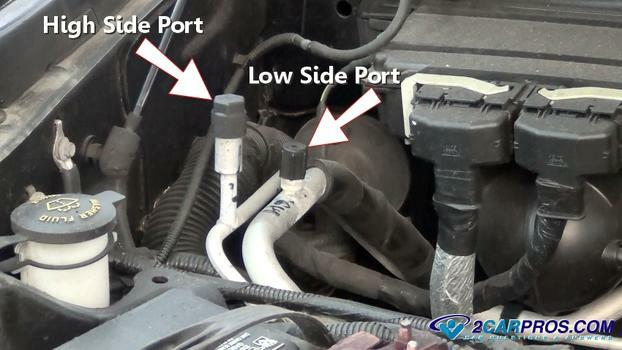 The low side fitting will not fit over the high side port to avoid confusion. When attempting to attach the kit connector you will hear a slight amount of pressure being released for a spit second while the seal is being lodged onto the port flange which is normal. After attaching the charge kit the gauge will indicate the static pressure in the system (engine off). If the system is flat with no pressure showing on the gauge there is a leak that must be found and corrected before charging can begin which we cover further on in this article. 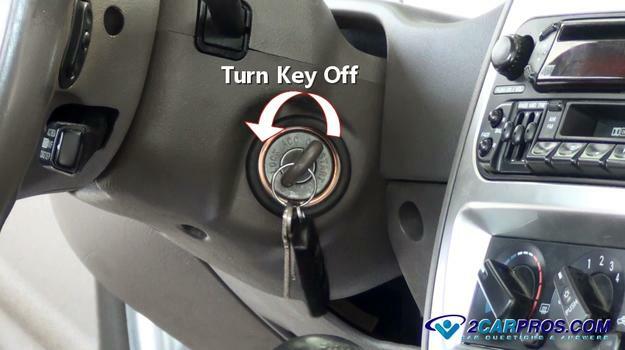 The system in the example is simply low on charge which is indicated by the gauge. The needle should be in the green for a sufficient charge. Start the engine and allow it to idle and warm up to operating temperature. You don't want to charge the system when the engine is cold because the refrigerant pressure rises with heat which can lead to overcharging the system. 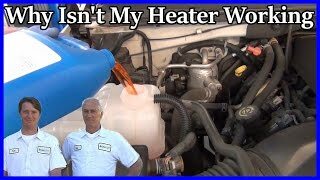 Have a helper hold the engine idle up slightly to help warm the engine. This also helps when charging the system and should be continued until the job is done and you are ready to disconnect the kit. Once the engines is running turn the air conditioner on and adjust it to the coldest settings including the highest fan speed. This is to work the system to the max which will ensure a full charge. After the system is turned on wait 30 seconds. 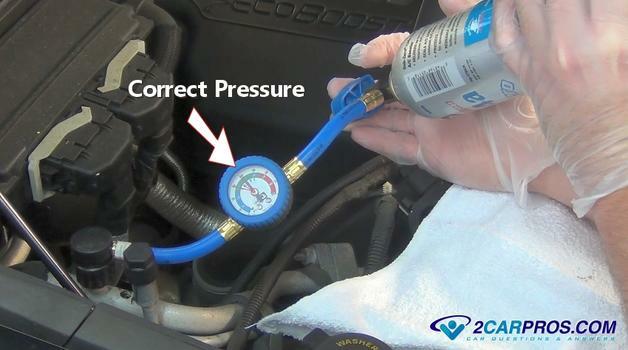 The compressor should begin operating which will be followed by the pressure dropping on the gauge. Once this happens turn the can upside down and press the plunger valve inward toward the can which will begin the release of the refrigerant into the systems low pressure side tube while the gauge pressure rises. Continue this for a few seconds then release the plunger. The gauge will go up signaling the transfer from the can into the system and then back down again once the plunger is released. 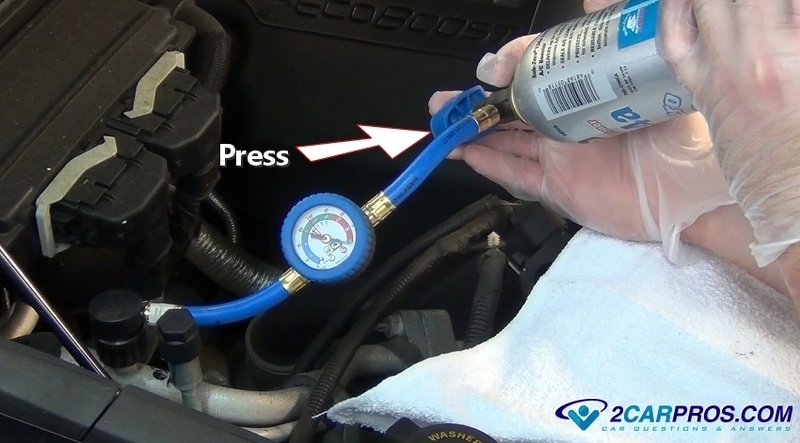 Continue this process of press and release until the system has the correct pressure which is indicated on the gauge. Do not overfill the system it will not help it be even colder than it already is. In fact if the system is overfilled it will do the opposite and the system will not work as well. If you accidentally overfill the system refrigerant will need to be bled off. When the system is full the gauge on the kit will show somewhere in the middle on a normal day with an average temperature (about 80° F or 26° C). If the outside air temperature is warmer then usual the gauge should read on the upper side of full but not into the red. Keep checking the outgoing temperature of the air coming out of the vents inside the vehicle. You should feel the coldness coming back to normal, about 52° to 57° F or 11° to 13° C the system is now fully charged. 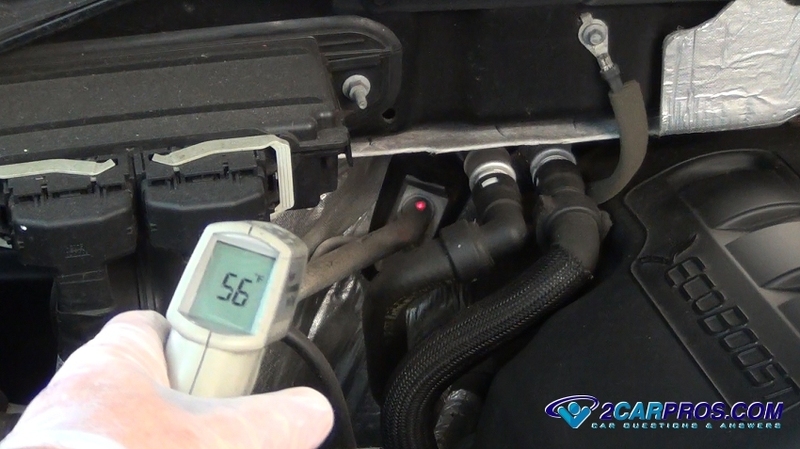 An additional way to check if the system is fully charged is to use an infrared temperature meter which gives you and correct reading directly on the outgoing low side a/c tube from the evaporator which also indicates a full charge. You can also use your hand, the tube will be cold to the touch. Once the maximum coldness has been achieved and with the engine and system still running release the connector collar to remove the kit. 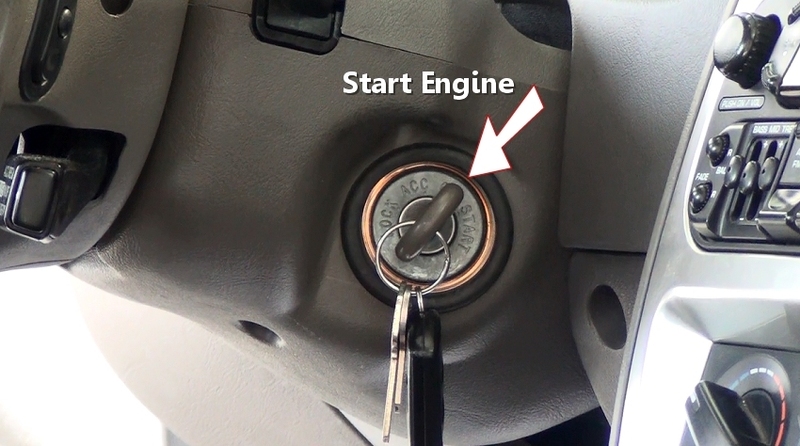 If you shut down the engine and allow the system to neutralize the pressure will rise making it more difficult to disconnect the kit connector. Pull upward on the valve retainer ring on the valve. Doing this will release the connector and the service port will close automatically. Once the kit has been removed reinstall the dust cap to the port do not over tighten the plastic cap. Turn the ignition switch to the off position to shut down the engine the a/c system will shut down as well. Enjoy the cold air! If an air conditioner repair of any kind is performs it is recommended not to simply add Freon because it will trap moisture and ambient air inside the system which can cause damage. 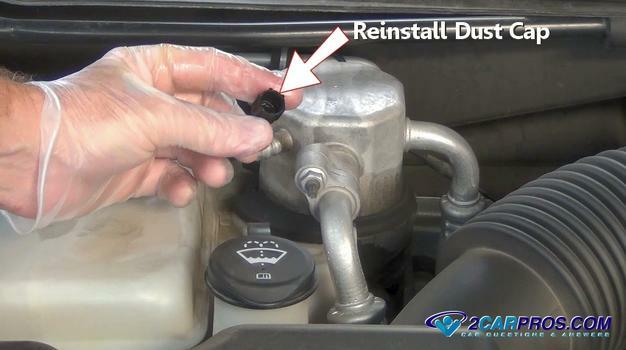 You should vacuum down and recharge the system which removes this moisture and helps the system perform optimally.